Last I reported, J had abruptly dropped gymnastics with high hopes for getting on her school volleyball team. She ended up being the only 7th grader who participated in the varsity/JV try-outs (another 7th grader showed up but didn’t play because of an injury), so when the coaches told various older girls whether they’d made it and to which team, they basically just told J that she’d been impressive to come and show up and that doing so would be excellent for her when it was time for modified try-outs. Then she had a little break until it was time to show up for modified try-outs, which were the last week of August. Now, the modified sports are labeled as “developmental” not “competitive,” which means it’s all about learning how to play the sport, and theoretically, the try-outs should be pretty low-key. I was under the impression that they pretty much didn’t ever cut anyone from modified teams. Turns out I was wrong. Over the 3-day try-out period, we gleaned that there were 22 girls at try-outs, and the coach warned the girls that the maximum number on the team would be 18, but she was likely to choose fewer than that. So on day 3 I showed up a little bit earlier because they finish the last day of try-outs by having a little one-on-one conference with each girl, who subsequently leaves and either celebrates or mourns. That’s similar to soccer try-outs, where some of the moms will stay in their cars with the motor running so that they can just evacuate ASAP if necessary. I ended up standing around, chatting with two other moms, both of whom had 7th grade daughters who are friends with J. The first girl came out and we stood there on tenterhooks in the parking lot, waiting for our kids to appear. J came out smiling. She gave a thumbs up to confirm she was on the team. Then a daughter of one of the moms and another 7th grade friend came out smiling. The girls chattered happily away while waiting for their last friend, daughter of one of the moms. She came out and you could just see it on her face. There was a moment of panic: should we stay? Should we go? And then everyone just scattered. Ugh. The coach ended up cutting 8 of the 22 girls for a team of 14. J was super-excited to be on the team, and she really enjoys practices. The first game was Tuesday before last, which was while Cute W was away. Watching volleyball is a brand-new experience for me. I mean, I’ve watched volleyball games before, but I didn’t pay much attention to what’s actually going on. There are all of these mystifying things that happen, like sometimes a pair of girls would start out holding hands, sometimes there’s a girl wearing a different-colored jersey, the way they sub sometimes seems baffling, and the players help with officiating by judging when things are in or out. Since that first game, I’ve learned a little bit. The girls have to rotate before a serve just like you do at your backyard barbecue, so when the girls start out holding hands it’s because they’re going to immediately switch places. The girl wearing a different jersey is a designated libero, who’s a defensive specialist who does a lot of the first passes (ideally a team will pass, then set, then spike the ball when it’s on their side). 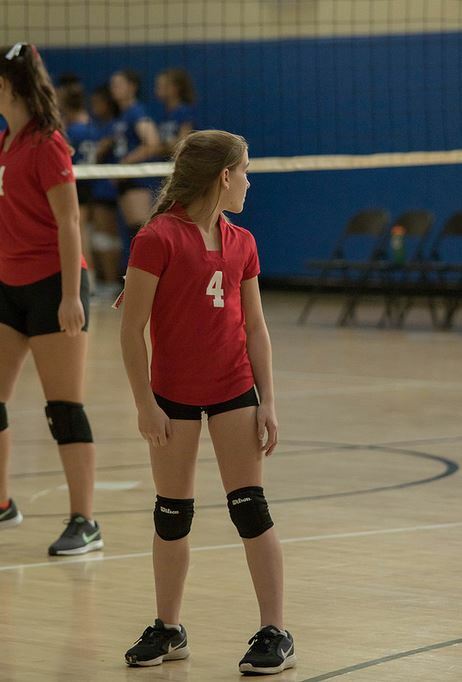 The libero isn’t allowed to play offensively by hitting the ball when it’s above net height and is allowed to sub in and out whenever, unlike the other substitutions, which are tracked by the officiants as the girls stand palm-to-palm. At our level, the girls play three games in one set, and one set is what they’ll typically play in what any normal people would call a “volleyball game” between two schools. The first team that hits 25 points wins the game as long as they’re ahead by 2 or more, and if the same team wins the first two games, they’ve essentially already won the set and could be done, but typically the schools will play a third game to allow the weaker players to get a chance to play, something we call “the fifth quarter” in modified soccer. Phew! I didn’t know all of that when I was there for that first game (which, again, is technically called a set). Here’s what I knew: J did not touch the ball the entire time. For the first game, the same six girls played the whole game. For the second game, J was put in and pulled out so quickly that she never even got an opportunity to get near the ball. It was our bad luck that the games were tied 1-1, because that meant that the third game mattered, and J was stuck on the bench again. It was excruciating to watch. She started out super-excited and ended feeling really bummed out. I thought that quitting gymnastics would leave J with tons of free time, but she’s still pretty booked during volleyball season. She’s leaving for band or chorus every morning before school, then volleyball practice (or a game) is after school until 5 or 5:30 pm, and then of course there’s homework. But she’s having fun, and she’s already decided that she wants to try to play club volleyball in November, when the school season ends. That’s likely to be only once or twice a week, so I’m encouraging her to try some other active things, too. When she first quit gymnastics she really wanted to still go to a weekly gymnastics class, but when I last asked, she wanted to wait until the end of volleyball season. We’ve also pondered dance and diving and some other things, but I’m not sure what she’ll do when volleyball season is over. We’ll see how it goes. Thanks for updated us Katie. Carry on..